So, basically, after one viewing I loved the movie and already knew I’d be excited to watch it on Blu-ray in the comfort of my own home, and to also check out the bonus features. And here we are, several months later with me now in possession of a “Cinematic Universe Edition” Blu-ray review copy, complete with lenticular cover insert, after having left no one else on staff standing. (Yes, I’m a brutal conquerer and dictator!) Right away, I was like, there’d better be feature-length audio commentary on this thing! And, yes, director Scott Derrickson did provide this for the Blu-ray Edition, so he’s safe. Ok, so now that everyone’s restraining orders are in place, I’ll talk a bit about this little film called Doctor Strange, starring one of my favorite actors ever Benedict Cumberbatch as the title character. In my original Dolby Cinema write-up, I took the opportunity to poke a little fun at the movie I enjoyed so much, giving out my own awards for categories like “Best on-screen LSD trip” and “Most likely to need medication for bipolar disorder.” I did this because I had planned to save my “serious” review for the Blu-ray Edition, but look, this movie is trippy and it’s even more trippy on subsequent viewings, so I don’t know how this is going to go. Let’s see. In Doctor Strange, British thespian Benedict Cumberbatch goes American to play Dr. Stephen Strange, whose arrogance and recklessness leads to his downfall and the end of his career as a brilliant neurosurgeon after his hands are crushed in a car accident. 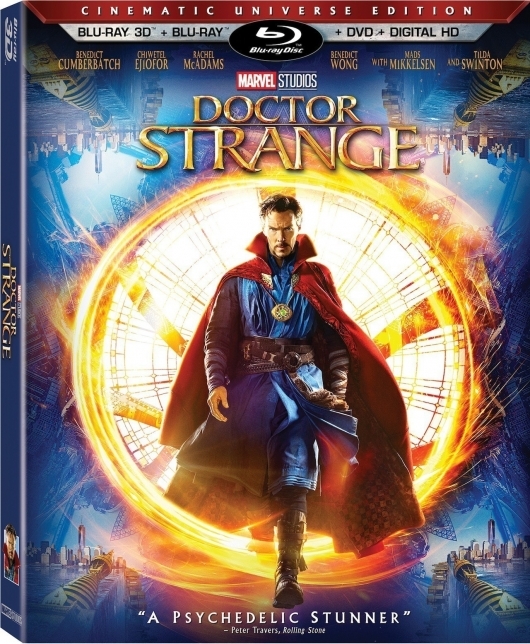 After many failed attempts to regain the use of his hands, Strange seeks a rare treatment in the Far East, where he mets Chiwetel Ejiofor‘s Mordo, who serves Tilda Swinton‘s Ancient One, who teaches the doctor marital arts and mysticism. In this origin story, we see Strange’s rise to become the Sorcerer Supreme, where he goes on to face his first battle with evil in the form of Mads Mikkelsen‘s Kaecilius, a former pupil of the Ancient One who now follows the dark ruler, Dormammu. Dormammu, of course, wants to pull the Earth into his Dark Dimension, because as we all know, Earth is where it’s at. One of the best parts of the film? When Strange comes to bargain. You’ll see. Also, the Cloak of Levitation. Best inanimate-animate object ever. So, in case it’s not obvious, I loved Doctor Strange and highly recommend repeat viewings. Below is a rundown of the Bonus Features, including my comments on them. – FEATURETTES: The Blu-ray and Digital HD Editions contain five featurettes that go behind-the-scenes on this new installment in the Marvel Cinematic Universe, that adds magic and mysticism to the usual superheroism. Each of these have interviews with the director and stars, and some also include producers and crew. The Blu-ray allows you to play all of these featurettes straight through (totaling 58:05) or individually. My individual listing descriptions are just below. These featurettes come with the option for closed captioning in English (for the Deaf and Hearing Impaired), French, and Spanish. The audio can also be played in English, French, and Spanish, as well as with Descriptive English turned on, which is to aid those with visual impairments. – A Strange Transformation [9:42] – This goes into detail on bringing the comic book character to the big screen. We see title star Benedict Cumberbatch, who provides interview footage on what drew him to this project, training for the physical scenes as well as those where he’d be shown as a neurosurgeon. Lots of green-screen action, and stunt work shown. Director Scott Derrickson said that Cumberbatch was his first choice for the role, and they pushed their schedule in order to let the actor finish his stage run of Hamlet. – Strange Company [12:37] – Director Scott Derrickson talks about Rachel McAdams’ role as Stephen Strange’s love interest, fellow doctor Christine Palmer, as well as the casting of Tilda Swinton as The Ancient One. The actresses speak about their respective roles, and Swinton mentions about the gender issue – her playing the role that has always been for a man. Then there’s Benedict Wong’s Wong and Chiwetel Ejiofor’s Mordo, and how their characters were updated for modern audiences. And then there’s, of course, Mads Mikkelsen’s villainous Kaecilius and his influence in the MCU. In this one, we get to know how intense Derrickson was with this project, and his vision for it. – The Fabric of Reality [12:32] – A place where Doctor Strange veers away in the typical structure of the Marvel Cinematic Universe is its trippy yet intricate set pieces, and this featurette goes into detail on the set design and construction, costumes, and other production aspects of the film. One of my favorite elements of Doctor Strange is the title character’s cloak, the Cloak of Levitation, which was a character all on its own. So here, the cloak gets some focused attention. We also get to see the set recreations of actual locations, which were faithfully done. – Across Time and Space [13:21 ] – While every Marvel movie requires its lengthy share of fight choreography, for Doctor Strange a new fighting style was invented to make it more unique. It’s a blend of four different martial arts. Obviously, this required many hours of training for the actors to not only learn the new fighting style, but to also learn dance choreography so that the magic gestures would look good. They even go so far as to do training on finger movements. In this featurette, we hear from the choreographers; see the actors doing their trainings; and the stunt work. While all the featurettes for this Blu-ray are interesting, this one was my favorite, as we get to see Benedict Cumberbatch — an actor known more his dialogue skills than his physical prowess — in action. – The Score-cerer Supreme [9:51] – Another departure from the regular Marvel Cinematic Universe is the score for Doctor Strange. While it does contain the bombastic, heroic elements, it also has its darker, but softer moments that incorporate the mystical feel, with its use of harpsichord and electrical sitar. This featurette gives a look at the orchestra’s recording of the score, and centers on composer Michael Giacchino. This film has a fantastic score, so this behind-the-scenes look at the music is very cool. Marvel Studios Phase 3 Exclusive Look [7:28] – We’ve been through the wild ride that was the Phase 1 and 2 films of the Marvel Cinematic Universe, which introduced us to the superheroes of The Avengers, as well as those A-holes, the Guardians of the Galaxy, and of course Doctor Strange himself. Now, this bonus feature gives an early look at Marvel Studios’ Phase 3 line-up, which will include Guardians of the Galaxy Vol. 2, Thor: Ragnarok, Black Panther, and Avengers: Infinity War. This features a look at the existing films before segueing into the new movies, with behind-the-scenes footage and interviews with cast and crew. If you’ve enjoyed the MCU so far, then they’ll be psyched for sure for the upcoming Phase 3 offerings. – Team Thor: Part 2 [4:38] – This is another humorous short featuring Chris Hemsworth as the Marvel superhero Thor, who now lives in Australia with his roommate Darryl. You’ll see, you don’t want to play games with Thor. Good stuff. – Deleted Scenes – [7:52] About 8 minutes’ worth of deleted or extended scenes from the film, broken down into five different sequences. – Gag Reel [4:12] – A short reel of bloopers from Doctor Strange, which is a treat considering the serious tone of the film. Anything showing me Benedict Cumberbatch being silly, having fun, or missing his cue is something I want to see. 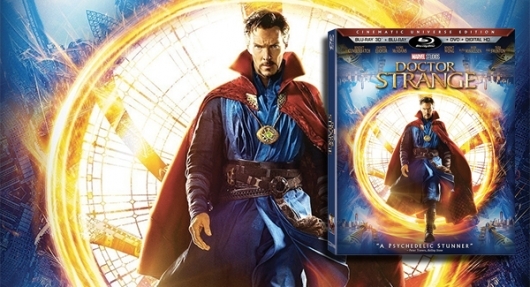 – Audio Commentary by Director Scott Derrickson – This is the feature-length audio commentary by director Scott Derrickson, who makes his love for and dedication to this property very obvious in all the attention to detail. So so so much information revealed in this nonstop commentary that it is a must-view for fans of the movie.